In the last of this series (since I head to KBIS next week), the spotlight today is on New Ravenna Mosaics, out of Virginia. I’ve loved their work ever since fellow blogger Paul Anater of Kitchen and Bath Design posted their stunning design work. Much of the work they’re known for is creative and individual pattern creation, mosaic by mosaic. Yet they haven’t forgotten the rest of us. 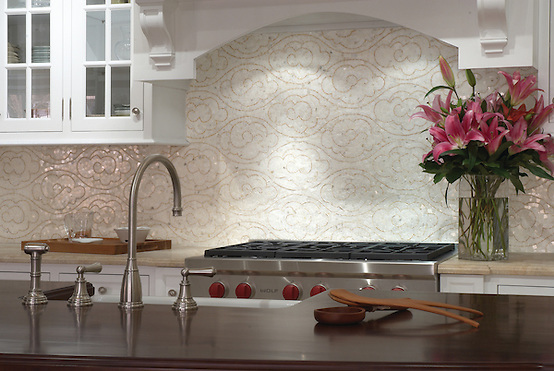 This year, the Mosaics Kitchen Collection 2011 displays everything from water-jet cutouts to basketweaves to mini-linear patterns. They’re also debuting Studio Line, a ready-to-ship line curated by designer Sara Baldwin at KBIS this year. It was created in order to have a selection of New Ravenna patterns in stock and available within 48 hours. There’s more, and I’m looking forward to seeing everything in person and reporting back to those of you not attending the show. For those of you who are, you’ll find New Ravenna in in booth C5499a.